Ideal for repairs and sewing leather, canvas, sails. Complete with 2 straight needles, waxed thread, combination wrench/screwdriver and instructions. 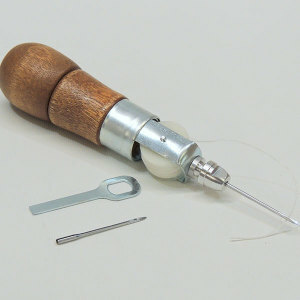 Additional thread and needles available. My parents bought this for me nearly 50 years ago. Works great for leather repair, too. Used it just last month to repair a leather belt. Just as described. I have not used it yet but should work fine.